“I really cherish and value the history that comes along with the ability to vote because I know the people that came before me worked so hard and endured a lot just for us to be able to vote today, and I don’t take that for granted,” Payne says. For student Veronica Cruz it’s her first time voting. “I look forward to getting it and it also shows that I voted so it could give other people motivation to vote,” the 19-year-old says. Cruz says selfies featuring “I Voted” stickers are all over her social media feeds too. Brittney Smith says she isn’t voting in this election - but even if she was, she wouldn’t wear the sticker because, for her, politics are personal. "So I don’t want people coming up and asking me and then maybe start a fight or whatever just because of our differences in opinion, so I'd rather just keep it to myself,” Smith says. So, when did all this sticker business start? Fresno State history professor Lori Clune says it’s hard to know when the very first ones were used. One newspaper story in Miami pinpoints the time to 1982 when businesses bought stickers and gave them to polling places. Clune says those businesses would then offer discounts to patrons wearing the stickers. She notes that this would have been illegal if one of those business owners was on the ballot. In the 1990s, Clune says state and local governments started paying for the stickers. 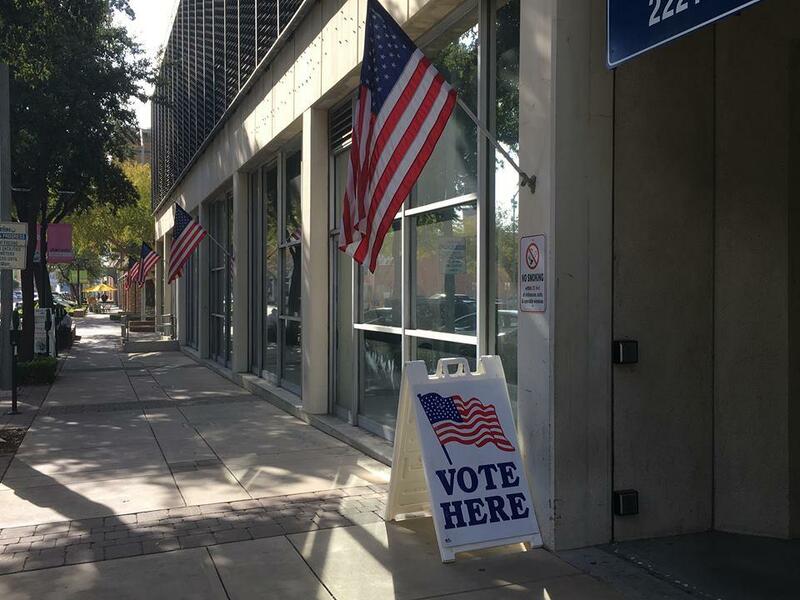 A voting sign outside of the Fresno County Clerk's Office. But there are some places that won’t give them out, like Chicago. Clune says people started sticking them to windows and scraping them off was a problem. Now the city gives out “I Voted” wristbands. Clune says that for some women the sticker celebrates the 19th amendment, which gave women the right to vote. On election day, dozens of women go to Susan B. Anthony’s grave in Rochester, New York to put their “I Voted” sticker on her tombstone. She says most historians agree that by 1988, the “I Voted” stickers were all over the U.S. A year before that, Janet Boudreau designed one of the most popular versions of the sticker -- the one with the U.S flag blowing in the wind. “You know, my only hope for it, in the beginning, was that it would just help get the vote out," Boudreau says. "At the time, people would forget that it was election day and not everywhere had early voting. It's prominent now. So, if you missed the election day then too bad." At the time, Boudreau was the president of an election supply company called Intab. She didn’t expect the stickers to take off like they did. Fresno County Clerk Brandi Orth says they have enough stickers for the roughly 400,000 voters in the county. She says people "absolutely" ask for their "I Voted" sticker after turning in their ballot. "If they don't see it right there it's like, 'Can I have a sticker,'" Orth says. But some people, like Natalie Moua, think the “I Voted” sticker is just that: A sticker. “I know what it means to vote even without the sticker because it’s our opinion, our voice, and even with or without the sticker you should know what it means to vote,” Moua says. Moua says she never gets the sticker because she has a mail-in ballot. But voter Cynthia Hudson came down to the clerk’s office to drop off her mail-in ballot just so she could stick on that "I Voted" logo. “This is a critical, critical election," Hudson says. "I think maybe one of the most critical elections of my lifetime, and I have very strong feelings about this, so I guess I want to encourage other people to do this."